George Denis (Denny) Chapman, Image courtesy Kerrie Nicholls. George Denis Chapman was born in Spring Hill on 26 August 1896. His father was George Barnett Chapman; his mother Mary Jane nee Capps. A brother, Harry, had been born in 1895, but died when George was one year old. Another brother, Benjamin, was born in 1898, and a sister, Mary (Winnie) in 1900. George senior was a successful sheep grazier at Spring Hill and young George, aka Denny, followed in his father’s footsteps. On 8 February 1915 Denny, his brother Benjamin and cousin Alfred, enlisted together in Liverpool. When completing their attestation papers all three claimed to be 18 years old. Denny was actually 19, Alfred 17, and Ben just 16. The three boys were assigned to 7th Light Horse Regiment, 6th Reinforcements. Alf and Ben embarked for overseas service on 15 June; Denny followed on 28 June. Denny served initially at Gallipoli, and then in Egypt. In February 1916 he was hospitalised with epidemic parotitis (mumps). 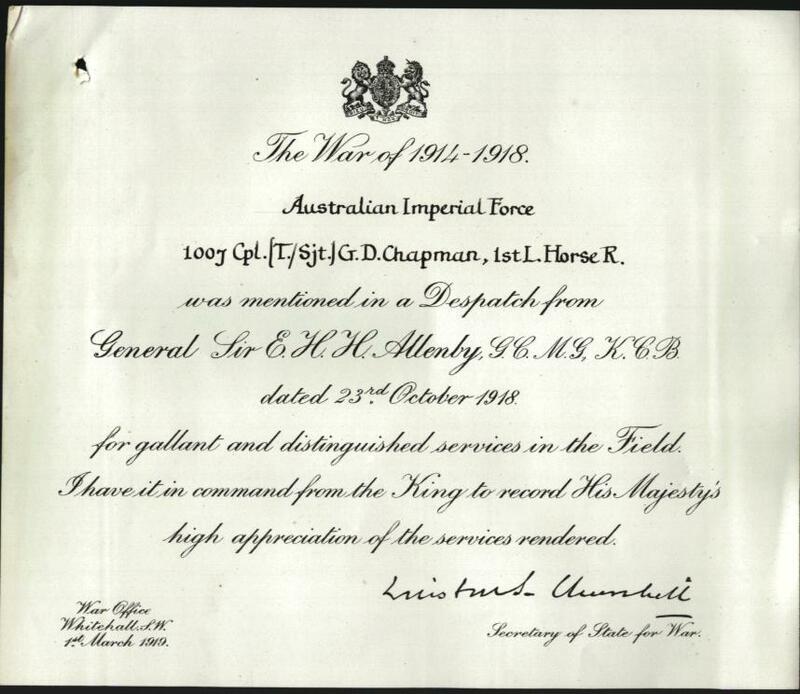 In August 1916 he was appointed Temporary Lance Colonel, followed by Lance Colonel in December. During his war service Denny composed several lengthy letters, describing in detail the battles he had participated, including the Battle of Rafa and the Battle of Beersheba. In another he described how his unit maintained their fitness by playing competition football in the desert. 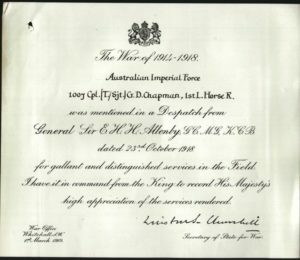 Lance Colonel Chapman was hospitalised for a second time in June 1917, again due to mumps. He spent two weeks in hospital before rejoining his brigade. In December 1918 Denny was promoted to Sergeant. He returned to Australia in April 1919 and resumed farming and grazing at Spring Hill. Denny’s brother Benjamin returned to Australia in August 1919; his cousin Alfred was killed in action in Palestine in November 1917. During the 1930s and 1940s Denny exhibited his Southdown and English Leicester sheep, winning several awards. 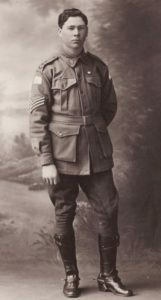 He was an officer in the Volunteer Defence Corps (VDC) during WWII and served on Canobolas Shire Council for eleven years. He was also a keen bowler who played at Orange and Millthorpe. Denny and Queenie later retired to Dover Heights, where Denny died on 22 September 1963, aged 67 years. The Central Western Daily of 3 October 1963 reported that Denny’s granddaughter Wendy travelled from England to attend his funeral. George Denis Chapman is commemorated on the Spring Hill Public School Honour Roll, the Spring Hill Church Roll of Honor, the Spring Hill Temperance Hall Honor Roll. This entry was posted on November 21st, 2017.